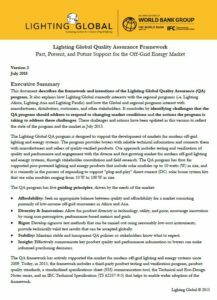 This document describes the framework and intentions of the Lighting Global Quality Assurance (QA) program. It also explains how Lighting Global currently interacts with the regional programs (i.e. Lighting Africa and Lighting Asia) and how the Global and regional programs interact with manufacturers, distributors, customers, and other stakeholders. It concludes by identifying challenges that the QA program should address to respond to changing market conditions and the actions the program is taking to address these challenges. These challenges and actions have been updated in this version to reflect the state of the program and the market in September 2016.